UCTV Goes to South Korea! We love hearing about how our programs have enriched the lives of viewers around the world. Check out this letter we received from Sookmyung Women’s University in South Korea. They have developed SNOW, a knowledge-sharing website that allows viewers to watch, comment on, and even post wiki-translations of educational videos from around the world. To date they have posted 889 UCTV programs, and translated 123 of them into Korean. We are excited our content is becoming increasingly available to a country with over 48 million people! Let us know how UCTV has impacted your life, and we might just post it on the UCTV blog! First of all, I am very pleased to contact you. I am Dong Eun Cheon, a researcher of SNOW 2.0 Development Team at Sookmyung Women’s University. 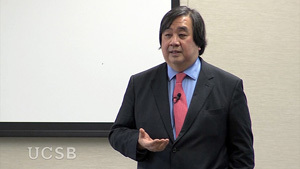 These UCTV lectures contribute to providing great intellectual inspiration to viewers. As our subtitle service has been more expanded, it is expected that more and more UCTV lectures will be spread among them. We are providing your contents not only with Korean titles, lecture descriptions and script but also with download functions for videos, audio clips and script files thanks to your permission. Also, since we developed mobile web applications for the iPhone, Android, and iPad at the beginning of 2010, your contents have been made more widely available via SNOW. Again, it is great to see that we have been able to collaborate on the “share knowledge movement” widely spread. I hope that this collaboration would be more encouraging this movement and lead to mutual growth for both of us.